Pavlovsk is the youngest of the imperial estates around Sain Petersburg, hosting a magnificent Palace and a unique park with natural landscape. Pavlovsk is a gracious residential district on the outskirts of St. Petersburg that blossomed and flourished around the Grand Palace, one of the primary residences of the Romanov dynasty. Located 30 kilometers south of St. Petersburg, this Russian town rose as a cultural setting for classical concerts billing Strauss, Schumann, Liszt and other great composers of the Imperial era. Today, it's considered a prime location for those who own second residences or country homes as getaways from the city during the summer months. History says that in December 1777, this elegant estate was gifted to Tsar Pavel and his wife, Maria Feodorovna by his mother, Catherine the Great, in honor of the birth of their first son, Alexander I, the future Emperor of Russia. The surrounding land was a prized hunting ground for the royal family. A day trip to Pavlovsk should definitely includes a visit to the fascinating Grand Palace, a fine neo-classical building with stunning interiors, and a stroll in the extensive landscaped gardens, a huge 1,500 acre park with tall trees, winding streams and endless paths flanked by benches. From its perch on a hill, the palace overlooks a pastoral countryside of dense woodlands, rolling lawns, bridges over meandering streams and quiet ponds. Colonnades, monuments and statues dot the landscape bordering the banks of the Slavyanka River, while the English gardens are said to rival the most exquisite gardens in the United Kingdom. Certainly not as grand as Peterhof, but much less touristy, Pavlovsk is well worth visiting both for the treasures in the elegant palace and for the charming park, which is one of the largest and finest English-style landscape gardens outside the UK. The country residence of the imperial family boasts beautiful architecture and captivating history, and is much less touristy than Peterhof or Tsarskoye Selo. To learn more click on the links below or scroll down the page. Originally built by Charles Cameron, Pavlovsk Palace is smaller and less grandiose than the palaces of Tsarskoye Selo and Peterhof. In fact, it's described as a stark contrast, with its modest Neoclassical design and tastefully ornate interior. While praised for being remarkably beautiful, visitors say it feels more like a family home that authentically speaks to Pavlov's (Paul's) life with his wife and ten children. The northern wing of the palace contains the Imperial family's Private Chambers, while the southern wing hosts Paul's Picture Gallery with impressive paintings by notable artists of the 17th and 18th centuries, such as Salvatore Rosa, Tiepolo and Rubens. Paul's passion for the military can be seen in the Hall of War and decorative motifs throughout the palace, while Maria's aesthetics shine in the room dedicated as her library. In addition to that you should also expect to see the The Imperial Chapel, The Grand Hall, Library of Paul I, Tapestry Room, Secretary's Room, The Billiard Room, The Old Drawing Room, The New Study, The Family Sitting Room, The Crimson Room, The Boudoir, and The State Bedroom. The Pavlovsk Park is a reflection of all the main tendencies prevailing in European landscape design around the turn of the 19th century. The main park buildings are concentrated around the palace and to the north-east of it - in the valley of the Slavianka. A common sentiment of those who visit Pavlovsk Park is the tranquility they experience there. Some say it's because it's not crowded or busy. Others say it's the pristine setting and natural landscape that creates a feeling of harmony. All say it's the perfect place to spend the day, unhurried and enjoying the serenity that's uniquely inherent to this destination. In addition to that you should also expect to see the Colonnade of Apollo, Rossi Pavilion, Pavilion of the Graces, Volliere (Aviary) Pavilion, The Private Garden of Empress Maria, and Gonzago Gallery. 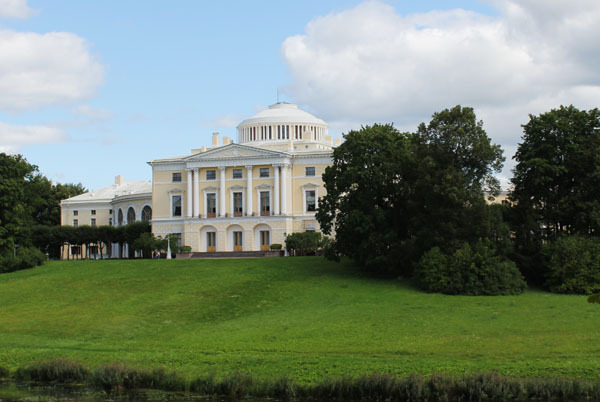 Pavlovsk is approximately 45 minutes to an hour from the city of Saint Petersburg by car, and only 15 minutes southeast of Pushkin and Tsarskoye Selo. To get there you have the option of driving yourself, taking a taxi from the city center or from Moskovskaya Metro Station, and, much better, you could hire a car with a driver, so travel faster, easier, and stress free. If you prefer to go by the public transportation, then from Kupchino metro station you must take Marshrutka 286, 545; from Moskovskaya metro station take Marshrutka 299; from Vitebsky station or metro Kupchino (last stop blue metro) you can also take a local train to Pavlovsk station (journey time 35minutes) which is close to the entrance to the park. Lastly, if you find yourself wanting to travel between Tsarskoye Selo (Pushkin) and Pavlovsk, then you can take the electric train or a minibus (K-545 or K-299), both means travel between the Catherine Park and Pavlovsk Park. You can buy the admission tickets on the spot at the ticket office upon your arrival. Open: May 1 to October 31: Open daily, except the first Monday of each month, 10 am to 6 pm. Last admission is at 5 pm. November 1 to April 30: Open daily, except Friday, and the first Monday of each month. The museum reserves the right to open ONLY the State Rooms and close other exhibits on Public Holidays. Accessibility note: This museum is not wheelchair accessible. Open: Daily, 6 am to 12 pm. Accessibility note: Full wheelchair access to the park is available. 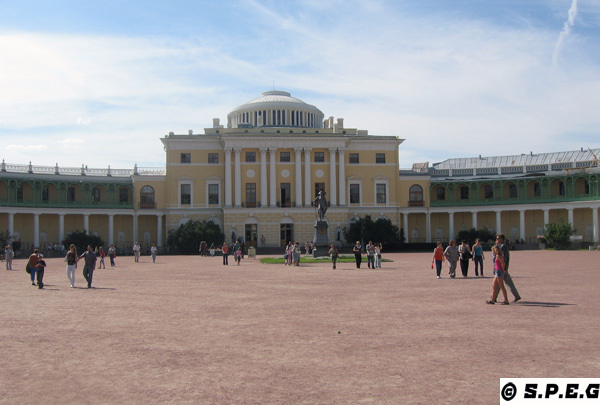 Many tourists try to see both Tsarskoye Selo and Pavlovsk in the same day – usually spending the better part of the day at Tsarskoye Selo and going to Pavlovsk at the end of the day. It is highly recommended to set aside a separate day for each. If time doesn't permit, people say to choose Pavlovsk over Tsarskoye Selo if you don't like crowds and long waits. It's incredibly beautiful and tranquil. If you want to see over-the-top grandeur and opulence and don't mind long waits, especially during the busy summer months, go to Catherine Palace in Tsarskoye Selo. Pavlovsk Palace and Catherine Palace are only a few minutes apart, so see them both on a day trip from St. Petersburg is highly recommended. We recommend hiring a tour guide before visiting the palace unless you speak Russian, while the park can be visited independently. 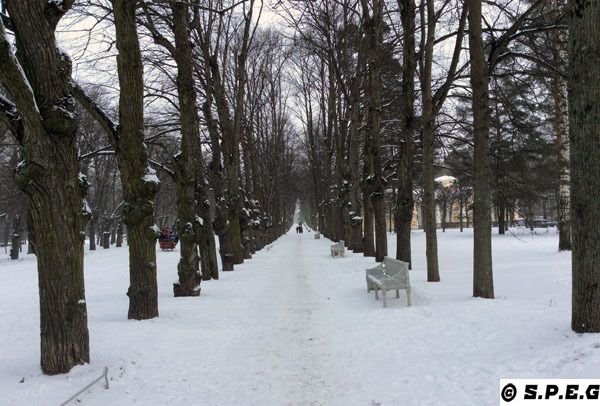 From Pavlovsk return to St Petersburg Attractions or go back to the Homepage.